ORDERED, sua sponte, that the Clerk shall file the ACLU’s lodged amicus curiae response as its response. The appeal was granted with no caveats or exceptions, suggesting that the appeals court views the decision by that wacky judge Natalia M. Combs Greene (now retired) this summer as being very badly flawed, much like the hockey stick itself. Anthony's wrong. The appeals court didn't overturn anything let alone "with no caveats or exceptions". No appeal was granted. On the contrary, some appeals were dismissed. Nor did it accept any amicus curiae as fact. It only ordered that various amici curiae be filed. The appeals by Mark Steyn etc be dismissed because Michael Mann amended his complaint, so the appeals are moot. They've subsequently lodged new appeals which remain pending. The dismissal of the appeals doesn't prevent the appellants from lodging new appeals. 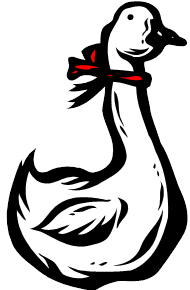 Anthony Watts is acting like a goose again! I'd say there is nothing to see there. It's nothing more than legal housekeeping. Anthony Watts is acting like a goose (again). That's not how I or others read it. It's housekeeping that's all. I've linked to the order in the post above. It's pretty clear even to a non-expert. The appeals were dismissed. There is no ruling to "try again" and no mention of the prior ruling other than that Michael Mann has amended his complaint as the reason the appeals by the Steyn camp were dismissed. I don't know anything about the amended complaint or how far it has progressed. Yes, definitely housekeeping. While I'm an environmental engineer and not a lawyer, dismissed without prejudice means it can be refiled under the anti-SLAPP laws. So the amended complaint is an opportunity for the defendants to try to stop the suit from proceeding in my reading. I'll need to see if Ken White weighs in on this one :). Yep, it was a confusing mess because so many issues were considered, but Tony got it wrong. The funny thing was that he had a lawyer comment on the post telling him he got it wrong and he still hasn't corrected it (of course it is still 6:15a there, so maybe later this morning). I don't think Anthony has any intention of fixing his post. He is getting very cavalier and reckless. Anthony's article is wrong for a number of reasons. 1. He wrongly said the Appeals Court has 'accepted the ACLU amicus curiae as fact'. That's not so. All the Appeals Court ordered is that it be filed. 2. He wrongly said that "the appeal was granted with no caveats or exceptions". That is completely wrong. In fact the two appeals before the Appeals Court were dismissed by the Appeals Court. 3. He wrongly said that the Appeals Court "nullified" the previous finding. It didn't. The Appeals Court made no ruling on the previous finding. As indicated, two appeals were dismissed, others are merely "pending". Michael Mann has amended his complaint. That may mean another hearing - but presumably in the main court first, not the appeals court. I don't know enough about the situation or US law to comment on that. In fact an amicus brief is generally a legal argument. The court may of may not take the arguments contained in an amicus brief into account in formulating it's opinion, but how it can be taken as fact is beyond me. The National Review and Mark Steyn are busy generating more material that could arguably be used in evidence, and which I doubt will go down too well with any court in the land. Oh wow Sou, just read your about page. Should have done that before commenting off a Michael Mann twitter re tweet link. Misogyny and climate change science rejection go hand in hand? Really? Linking the hating of women to the climate science debate is really not a good way to communicate the importance of the study of climate change science and political policy to mitigate the impending change in my opinion. I really cannot believe that a respected scientist, Nobel Prize winner and very public figure would link to your site. Oh wow Sou, just read your about page. Should have done that before commenting off a Michael Mann twitter re tweet link. Misogyny and climate change science rejection go hand in hand? Really? From where I stand there is a correlation but I've not tested it with any survey. It makes sense when you think about it. Some surveys suggest that more women than men accept climate science. Older people are somewhat less likely to accept climate science. It would be reasonable to suppose that both sexism and climate science denial are associated with older men more than any with any other demographic. That's not to say there is a causal relationship. Just that both sexism and climate science denial are probably associated most strongly with the same demographic. Linking the hating of women to the climate science debate is really not a good way to communicate the importance of the study of climate change science and political policy to mitigate the impending change in my opinion. I really cannot believe that a respected scientist, Nobel Prize winner and very public figure would link to your site. Known climate science deniers, on the other hand, have shown their sexism. For example, the HotCopper management and its moderation team members, who have evidenced deep-seated sexism and very creepy behaviour if not misogyny - as you'll have read, also reject climate science. Anthony Watts doesn't try to hide his sexism and neither does Willis Eschenbach. Not that I make a song and dance about any correlation between the two. It's just interesting when the linkage becomes apparent as your comment could suggest. Like I say, it's most likely a correlation by association with the same demographic. That's why I have generally kept the two topics separate. Seasons greetings everyone - young and old, men, women and children. "I really cannot believe that a respected scientist, Nobel Prize winner and very public figure would link to your site." LOL. Nothing quite so embarrassing as an idiot concern troll whose argument has just been demolished trying to recover ground by pompous posturing. Merry Christmas to you too Mike - it's nearly over here but it's been a lovely day today. Is this comment of Anonymous's attempting to say that if you think there might be more sexism amongst climate change denialists, then everything about your site must be wrong and therefore a respected scientist shouldn't link to it? This seems logically a bit loopy. Also, linking rejection of climate science with mistreatment of women reduces the importance of climate science? What should I infer from that ...? This is a good summary of what it means.